There are tons of diets that come and go. Today, however, we compare two of the most popular and reliable ones that have been around for years: the DASH diet vs. Mediterranean diet. We answer these questions on our way to see which one you should choose when trying to get healthier and lose a few extra pounds. There are all kinds of diets that people can use to lose weight or improve their health. Two diets in particular are known as the Mediterranean and DASH diets. These are among the better known diets around because they’ve been proven to help you lose weight as well as improve a lot of your chemical markers. Both of these health plans are designed to improve a person’s system from within. They use food that are nutritious and take away food or ingredients that are less so. As a result, many individuals use them to keep in good shape or get healthier so they can get off certain medications. So which diet is better for an individual? Let’s examine both diets to figure out the pros and cons of both plans. 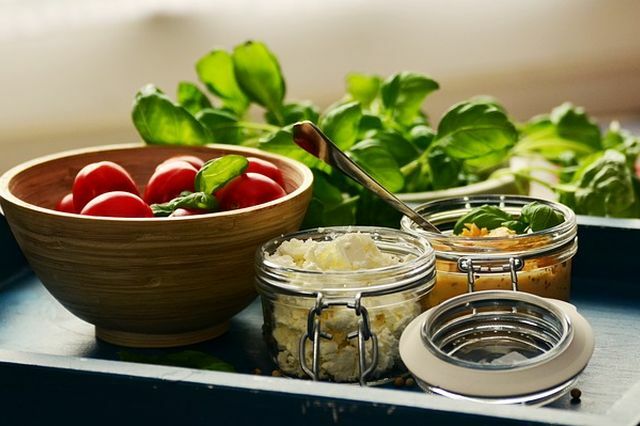 The Mediterranean diet is based off of the eating habits form people who reside in Spain, Italy, France, Greece and various regions within the Middle East. While a few of these countries are not located anywhere near the Mediterranean they are still used for this meal plan. 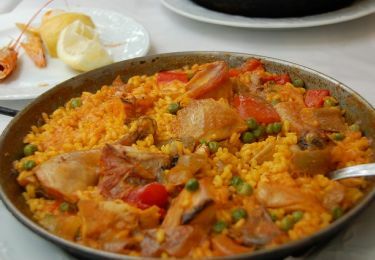 With this diet you follow the eating habits, along with the foods consumed by people in the countries mentioned earlier. People who reside in the Mediterranean tend to eat a whole food diet consist mainly of plants. This means no junk food. Instead, they eat meat, grains, vegetables and fruits. They also eat more natural foods as opposed to the processed varieties. What this means is that you also want to eliminate package goods as well as foods that have been processed. While many places within the Middle East are modernized. And, a great deal of the people who reside there still tend to rely on fresh foods for their meals. Fruits, colorful vegetables, whole grains, oats, rice, bread and pasta. Legumes, fish and lean meats are also heavily consumed. Nuts and olive oil is staple part of this diet as well. 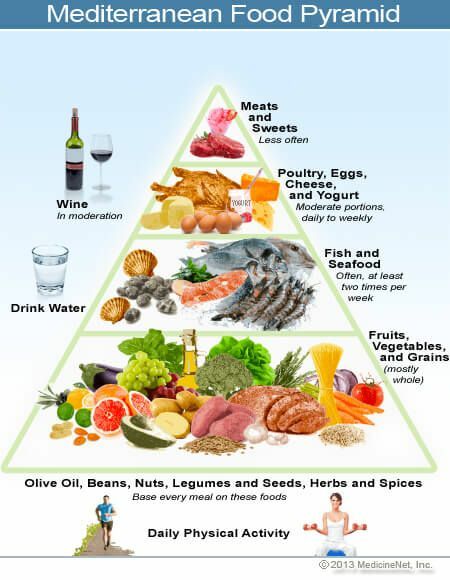 Here’s a Mediterranean Diet food pyramid from MedicineNet to help you quickly see the various foods and how much of each to consume while on the diet. The Mediterranean Diet is rich in fiber, antioxidants, vitamins and minerals. This diet contains a lot of phytochemicals, which are chemical nutrients present in plants. These nutrients are necessary for combating diseases such as stroke, heart problems, cancer and type 2 diabetes. The Mediterranean diet in and of itself is a lean food diet that is designed to keep a person’s body fit and trim. In comparison to the Mediterranean diet, the DASH diet has a much different goal. Well, at least in the beginning. The diet was primarily created to combat high blood pressure. D.A.S.H. actually stands for Dietary Approaches to Stop Hypertension. It is the diet that’s been heavily promoted by the government’s National Heart, Lung, and Blood Institute. And while it began as something that was geared for specific individuals, it has proven that to also be very effective in helping people lose weight, improve your cholesterol numbers and also ward off or manage diabetes. It is for this reason that a lot of people now use the DASH diet to help them stay healthy as well as maintain or lose weight. In fact, it’s been so successful that the publication US News & World Report has named the DASH diet the best diet for 6 straight years till now. In essence, the DASH diet is designed to provide a person with the right amount of nutrients and portions that will improve their health. This particular diet program doesn’t only help lower a person’s blood pressure but also helps them to maintain a good lifestyle. This diet stresses low sodium foods. 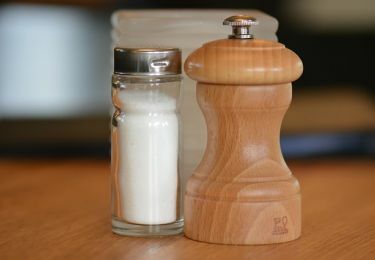 So cutting down on the table salt as well as foods high in sodium is key with this diet. Whole grains, fruits, vegetables and low-fat dairy products are main components of your meals. Fish, poultry and legumes are also a part of this diet as well. Extra sugar, like those in sodas and sugary drinks are limited. So are sweets. Finally, the diet is low in saturated fat and cholesterol. 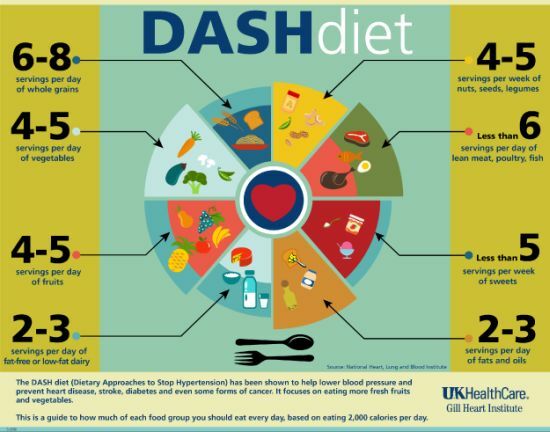 Here’s a DASH Diet food pyramid from UK HealthCare for a visual look at the components of this plan. What is the Difference Between the Two Diets? The Mediterranean diet is more focused on losing weight and staying lean. It does not necessarily reduce sodium intake or hypertension. Though these two conditions are side benefits of this diet plan. So if you follow the Mediterranean diet and the foods in it, you’ll also see your blood pressure as well as cholesterol numbers improve. The DASH diet on the other hand places a lot of focus on reducing sodium and reducing hypertension. Also, the DASH diet is more designed for heart health and lowering blood pressure. A person often loses weight with the DASH system but this would be a side benefit of this diet method. Both plans are beneficial to a person’s system and depending on what a person is trying to accomplish with their health; both types can be used for that particular purpose. 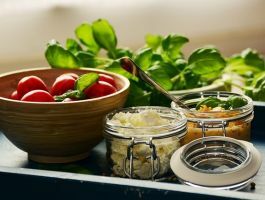 All in all, both the Mediterranean diet and the DASH diet are good choices if you’re looking to improve your lifestyle. They’re both different and have somewhat different main goals. Although the benefits gained from them do overlap quite a bit. Are you looking to lose weight or lower your blood pressure? Also, which diet can you follow better? This includes the kinds of foods involved as well as your budget.